We learned how to create fancy return address labels with LibreOffice in our last installment. Today we’re going to tackle mail merge. Mail merge is a powerful, time-saving word processor feature for addressing mass-mailings and form letters. It’s easy but a little weird in LibreOffice, so follow along and learn how to be a mail merge guru. Address Labels and Form Letters. If you’re not familiar with LibreOffice, it is a superior offshoot of the popular free office suite OpenOffice. LibreOffice is cross-platform and runs on Linux, Mac, and Windows, and provides a word processor, database, spreadsheet, drawing program, and slideshow creator. With LibreOffice you can create address labels and form letters. It all starts with your database of addresses, and then following the not-very-intuitive steps to merge your addresses into your document. This is not well-documented in the LibreOffice help documents, and if you try to figure it out yourself you’ll get lost. So follow along and learn the right way– it’s an easy few steps when you know how. If you don’t have an address database, you don’t have to be a guru to create one because we’ll show how to do that too. This entry was posted in Labels & Printing, LibreOffice.org, Open Source and tagged labels, mail merge on February 10, 2012 by wlmanager. FastMailMerge is an OpenOffice.org extension for those who feel intimidated by other alternatives. Unlike the standard OpenOffice.org merge tools or KBarCode, and allows you to see what you are doing each step of the way. Like any other extension, you can install FastMailMerge by downloading it, then opening Tools -> Extension Manager in OpenOffice.org. The next time you start OpenOffice.org, the extension is ready to use — but note that its icon is placed on Calc’s toolbar, because, even though it outputs to Writer and other text formats, FastMailMerge uses a spreadsheet as the data source. This entry was posted in Labels & Printing, Open Source, OpenOffice.org and tagged mail merge, Open Source, OpenOffice.org on May 5, 2009 by wlmanager. 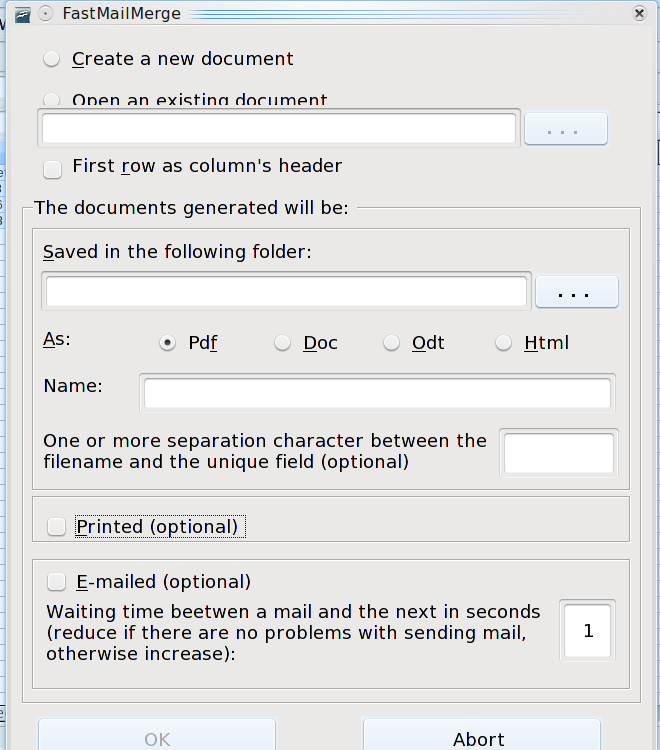 If you have read Solveig Haugland’s “Mail Merge in Openoffice.org: Everything You Need to Know,” then you already know how to use mail merge to reduce your workload in one free and open source software application (FOSS). However, OpenOffice.org is not the only FOSS application you can use for mail merge. You can also use AbiWord or KWord to get the same advantages. Both AbiWord and KOffice were originally built for GNU/Linux, but both now have versions for Mac OS X and Windows as well. AbiWord is a standalone word processor, while KWord is part of KOffice, which started as an office suite for KDE, one of the most popular interfaces for GNU/Linux. Although neither AbiWord nor KWord has as many features of OpenOffice.org, both are developed enough for many users’ needs. Some people prefer them because they are smaller and faster than OpenOffice.org, and therefore run better on older and slower computers. This entry was posted in How-To, Open Source and tagged AbiWord, koffice, mail merge on February 4, 2009 by WorldLabel Editor. Mail merge provides business owners, organizational leaders and even families a way to communicate easily and effectively with clients, members and friends. Mail merge allows users to personalize letters so that mass communication becomes more personal and yet efficient. Mail merge also is an efficient way to organize mailing lists for mailing labels. But, how can you use mail merge in Open Office? That’s the question! We’ve provided an In-depth guide to mail merge with OpenOffice.org which explains all the intricacies of using this powerful feature. Learn how to use the mail merge feature to create letters, labels, and envelopes. The guide is also available as a PDF eBook document for your perusal. Continue to article or download the eBook. The author of this article is Solveig Haugland, an author, instructor, and consultant near Denver, Colorado. She has been working with OpenOffice.org and StarOffice since 1999 and loves to show people how to make OpenOffice.org do what they need it to. She blogs at http://openoffice.blogs.com and her business web site is http://www.getopenoffice.org. This entry was posted in How-To, Open Source, OpenOffice.org and tagged mail merge, OpenOffice.org on January 14, 2009 by wlmanager.